Mariah Holmes, 27 of Riverside, studies as two heavyweight sumo wrestlers taken it to the mat in Carson Sunday, Feb.24, 2019. 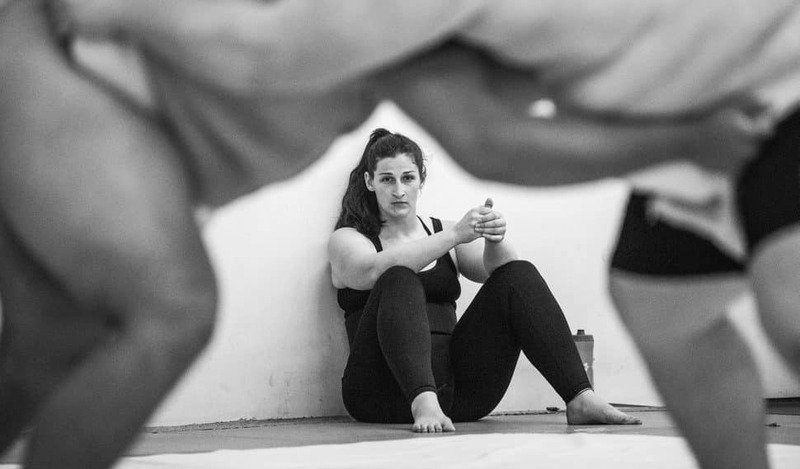 "Right now its big heavyweight men that's what sumo is to everybody of anybody that thinks of sumo and I hope the future is women" Holmes said. Photo by Thomas R Cordova. Every Sunday, Mariah Holmes, 27, makes the trip from Riverside to Carson to train in the backroom of a sports store. Holmes is one of the country’s top female sumo wrestlers who will be making her second appearance at the 19th annual U.S. Sumo Open on March 23 at the Walter Pyramid at Cal State Long Beach. This is the largest, longest-running sumo tournament in the world outside of Japan, and attracts some of the top sumo wrestlers. 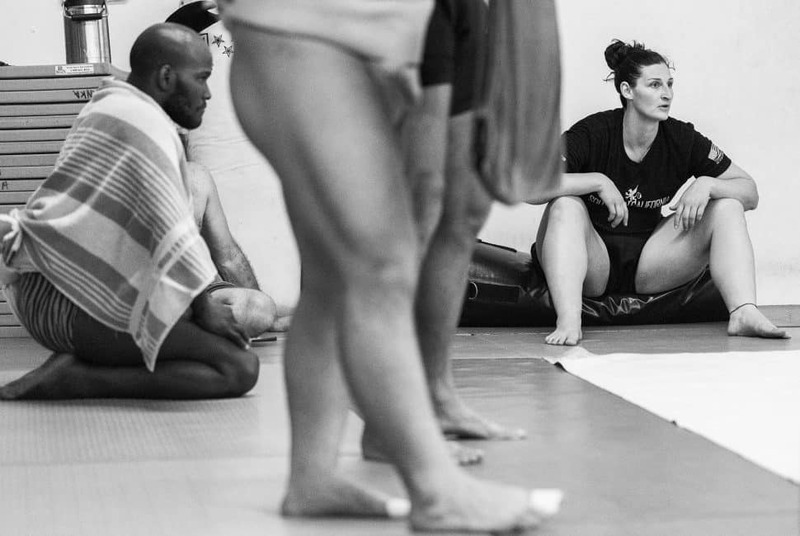 Last year, Holmes finished first in the women’s open event and second in her weight class, middleweight. But she is coming off of a serious injury she suffered in the Sumo World Championship tournament in Taiwan last year when she tore her hamstring off the bone. This will be her first competition since the injury. “I’m really nervous this year because I’m coming off an injury which has affected my weight and my strength,” said Holmes, who will be competing in the U.S. Sumo Open as a heavyweight. Walter Pyramid is located at 1250 Bellflower Blvd. (Atherton and Merriam Way). For further information or tickets, click here. Mariah Holmes, 27, of Riverside, studies as two heavyweight sumo wrestlers take it to the mat in Carson Sunday, Feb. 24, 2019. 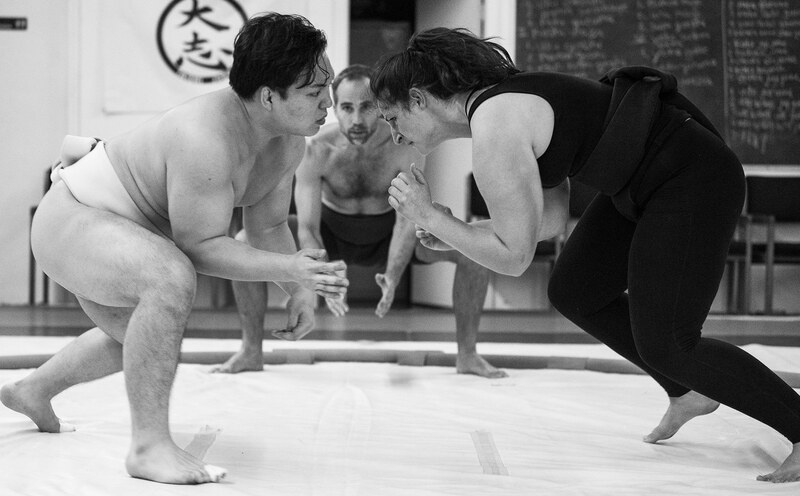 “Right now it’s big heavyweight men—that’s what sumo is to everybody [who] thinks of sumo. I hope the future is women,” Holmes said. Photo by Thomas R. Cordova. 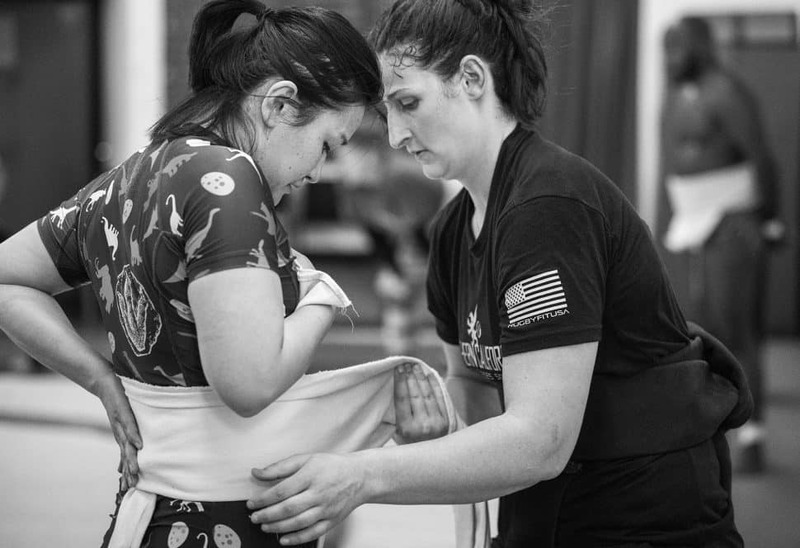 Mariah Holmes helps fellow sumo wrestler Jee Kim with her mawashi before practice in Carson Sunday, Jan. 27, 2019. “I have been an athlete for a very long time and I know that to keep a group going you have to be supportive and I know for me to get stronger as a competitor I need more competition. So they need to stay around for me, too,” Holmes said. Photo by Thomas R. Cordova. Mariah Holmes collides with Takeshi Amitani of Japan as the two prepare for the U.S. Sumo Open in Carson Sunday, March 3, 2019. 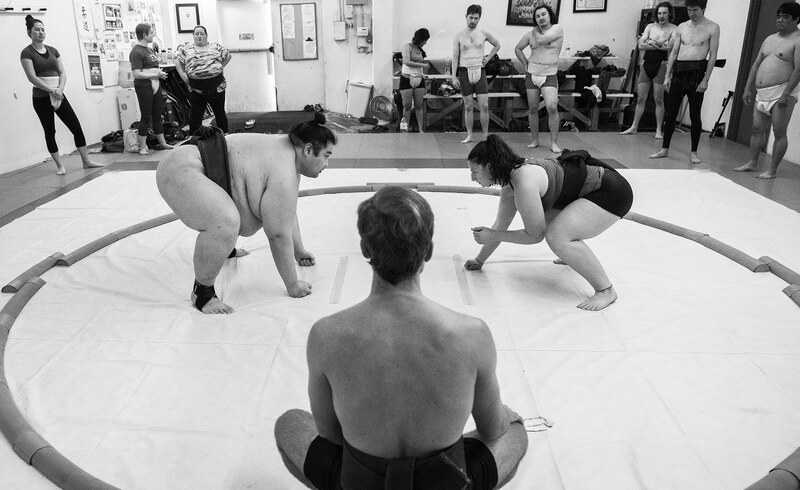 “Sumo is not just a physical sport—it’s really a lot of mental,” Holmes said. Photo by Thomas R. Cordova. Mariah Holmes sits on a mat as she watches her fellow sumo wrestlers practice in Carson Jan. 27, 2019. “As a woman, you walk in unsure, in a man’s world,” Holmes said. Photo by Thomas R. Cordova. Mariah Holmes observes Jee Kim and Nicole Casares as they wrestle in Carson Sunday, Feb. 24, 2019. “About 50 to 60 percent of this group are women and we are all close-knit. We are all friends—we come here, we talk, we gab, we know what we are doing outside of this group and I think that just makes us stronger,” Holmes said. Photo by Thomas R. Cordova. 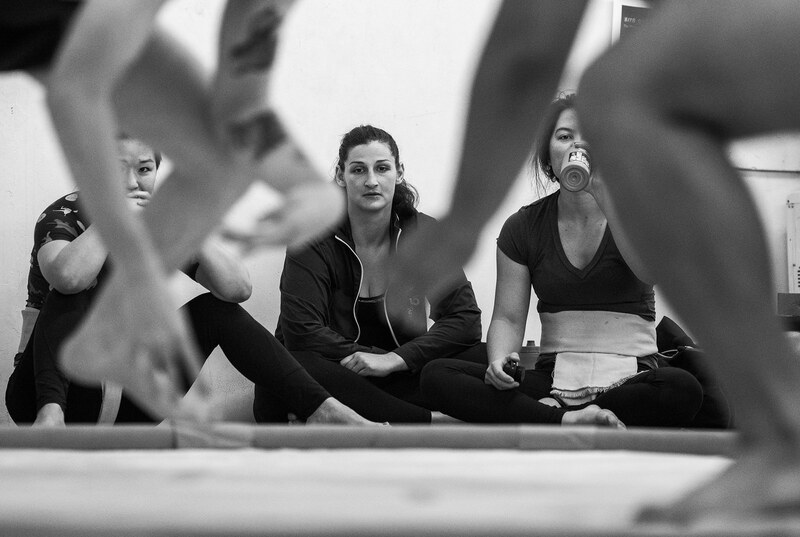 Mariah Holmes sits with fellow sumo wrestlers Jee Kim, left, and Vanessa Flanders, right, on the edge of the mat during a recent practice in Carson. 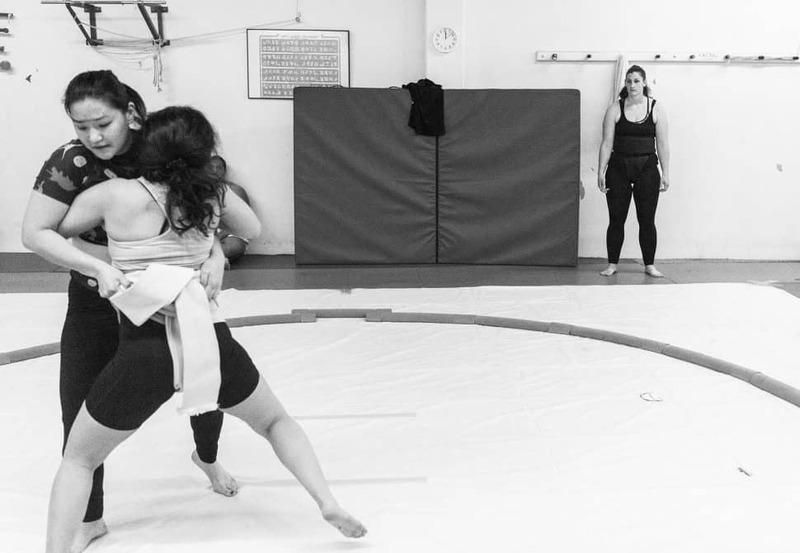 The sumo practice is about half women and half men. “I came into this sport with very (few) women: fresh, brand new, knowing nobody—and find such a support group. That’s been such a blessing to me,” Holmes said. Photo by Thomas R. Cordova.